This week Aquarius, the Water Boy, will appear due south at around 9 p.m. local time. 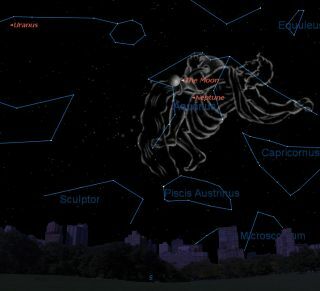 Aquarius, an easily overlooked star pattern with a storied history, will appear to the south during the evening this week. For almost 30 years, I've served as a guest lecturer and instructor at New York's Hayden Planetarium, and if there is one thing that I think has set me apart from my colleagues, it is the eclectic way that I give a constellation talk. As an example, I might point to Orion, the hunter, and if there is a sizable proportion of young people in the space theater, I might tell them to try and trace not a mighty hunter, but Batman among the stars instead. Orion's three-star belt becomes the Dark Knight's famous utility belt. Using my electric pointer, I might say, "And there's Bobby Boucher" (pronounced "Boo-shay"). More often than not, that doesn't get much of a reaction. But if I follow that up with, "Maybe I should have said, there's Adam Sandler," I'll hear a murmur from my audience, who suddenly will make the connection. For back in 1998, Sandler starred in a very popular American sports/comedy film, "The Waterboy." And indeed, in the evening sky right now is a constellation that could represent a water boy, although it is better known as the water bearer or water carrier: the zodiacal star pattern of Aquarius. In the movie, Sandler plays the comedic role of Boucher, who serves on a football team as an inept water boy: Among other things, he sloshes water all over the place. The same holds true with Aquarius, who's sloshing water across the early fall sky in the so-called "watery" region. It gets this namebecause the region is vague and dim, or as Guy Ottewell, editor of the annual publication the Astronomical Calendar notes, "like a dark pool." A number of other constellations near Aquarius are also associated with water: Capricornus, the sea-goat; Pisces, the fishes; Piscis Austrinus, the southern fish; Cetus, the whale; and finally Eridanus, the river. Nobody knows for sure why so many constellations associated with water are all grouped together into one section of the sky. However, some people think the link has to do with an ancient great flood in the Tigris-Euphrates basin, which has sometimes been linked to the deluge in the biblical Book of Genesis. However, it's difficult to say for sure, because the original significance of many starry figures was lost when the Greeks redid these star pictures with characters based on their own legends. As Bobby Boucher found out, water boys are on constant alert, providing much-needed hydration for practicing or competing football players. And in the hot and dry countries of the Middle East, it is quite common to hear the calls of boys going through the streets carrying jars or soft bags called bladders (much like the rubber bag inside a football) filled with cool water, which the boys will pour out for you into a cup. "Aquarius" is the Latinized word for such a water seller. Aquarius features many named stars: the astrologically-lucky Sadalmelik, Sadalsuud, Sadachbia and Albali stars; Sklat, "the lower foot" in Arabic; and Ancha, whose name refers to the upper thigh or hip in medieval Latin. The 'Age of Aquarius' — NOT! Earlier this month (on Oct.17), Jupiter aligned with Mars in a rather close conjunction. It reminded me of the lyrics of the popular song "Aquarius" from the Broadway musical "Hair." That song referenced the "dawning of the age of Aquarius." But in reality, such an age is nowhere near right now. The naming of an "age" refers to a period in which the vernal equinox — the place where the sun appears on the first day of spring — lies inside a specific constellation. But thanks to the wobbling of the Earth's axis, a phenomenon called "precession," the equinox point appears to shift slowly westward against the background stars, taking 25,700 years for one trip. Right now, the equinox is located in Pisces; so actually, it's currently the Piscean Age, and the Age of Aquarius will not dawn until 2599.